Home heating systems like furnaces or boilers keep your family warm and comfortable during the cold winter months. Unfortunately, not all homeowners recognize the impact that choice of heating fuel can have on both their wallet and the environment. Before you install your new heating system, compare some of the most commonly used heating fuels to find the one that best meets your needs. Natural gas and electric heaters rely on vastly different operating principles to produce heat. Gas-powered units rely on a traditional combustion process. A pilot light ignites the gas within a furnace or boiler. The ignited gas produces heat, which is then transferred throughout the home using fans or blowers. An exhaust vent directs combustion gases to the outdoors and draws fresh air in to repeat the process. Electric units receive electrical energy from local power plants, which they then convert into heat energy. As electricity runs through a copper wire or coil, for instance, the wire grows red-hot and will heat any air or water that's passed through it. This air or water is then used to heat the house via a standard furnace or boiler. Because no combustion is involved, there's no need for an exhaust system. Both electricity and natural gas can be used to power a variety of heating systems. Manufacturers produce electric furnaces or boilers, as well as baseboard units and heat pumps. Several types of small space heaters also rely on electric resistance to heat a room. Gas-powered systems include traditional furnaces or boilers, which utilize a network of ducts to transfer heat through the home. While some portable heaters are designed for use with natural gas, they must be used outdoors due to the need for venting. According to Energy Savers, natural gas heating systems provide a high level of energy efficiency, which can keep utility costs low. Efficient home heating also reduces air and water pollution, and protects the earth from greenhouse gas emissions and global warming. Electric heating systems eliminate the need for homeowners to install a gas line to the home. They also allow people to heat their homes in areas where natural gas isn't available, or may be too expensive to use. Electric space heaters provide one of the simplest and most effective ways to add extra heat to your home without adding a complex ventilation system. To enjoy natural gas heating, you need a gas line that delivers gas to your home. In some areas, you may be able to install a storage tank or other vessel on your property to provide fuel. Both of these options are expensive and complex, and can increase the costs of a new heating system. In addition, natural gas units require venting to release combustion byproducts, and must be carefully maintained to protect your family's health. 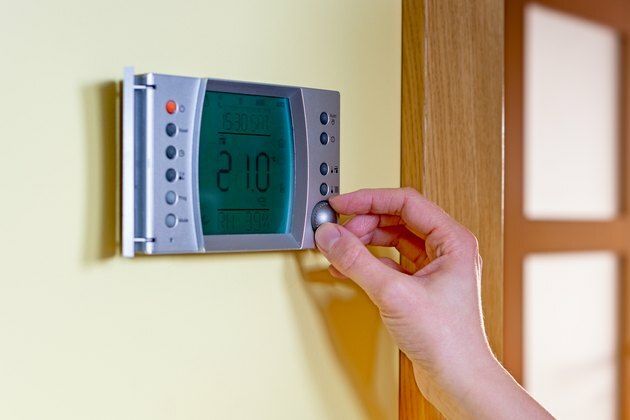 According to Energy Savers, electric heating systems are one of the most expensive and inefficient ways to heat your home. These units often feature labels touting "100 percent efficiency," but this is misleading. All of the electricity consumed by an electric heater is converted into heat, making them 100 percent efficient. At the power plant, however, producers burn gas or coal to produce the electricity that eventually fuels your heater. This process is vastly inefficient, and only about 30 percent of the energy consumed actually becomes usable electricity according to Energy Savers. The federal and state governments offer tax credits on many new home heating systems to encourage energy efficiency. According to Energy Star, homeowners receive 30 percent of the system's cost up to $1,500, and may receive even more from the state. Because of their inefficiency, no electric heaters qualify for these credits, with the exception of some heat pumps. Natural gas furnaces and boilers that meet a specified level of energy efficiency can help you qualify, which can offset the initial cost of these systems. What Is the Difference Between a Gas or Propane Stove? Do Space Heaters Save Energy Vs. Central Heating?